Honey intensifies the natural flavor of grains; for granola, honey makes the baked grains crispy. If you want to enjoy more of your honey, try using it on some of the basic cereals. Despite all the talk about the low-carb diet craze, the truth is, carbohydrates, like honey and whole grains, are good for you. Also, the grains are a source of vegetable protein. Whether it’s on granola or on Cheerios or even Corn Flakes, honey imparts a definitive flavor -much better than table sugar or brown sugar. There is no argument here that your own honey is a much better sweetener. 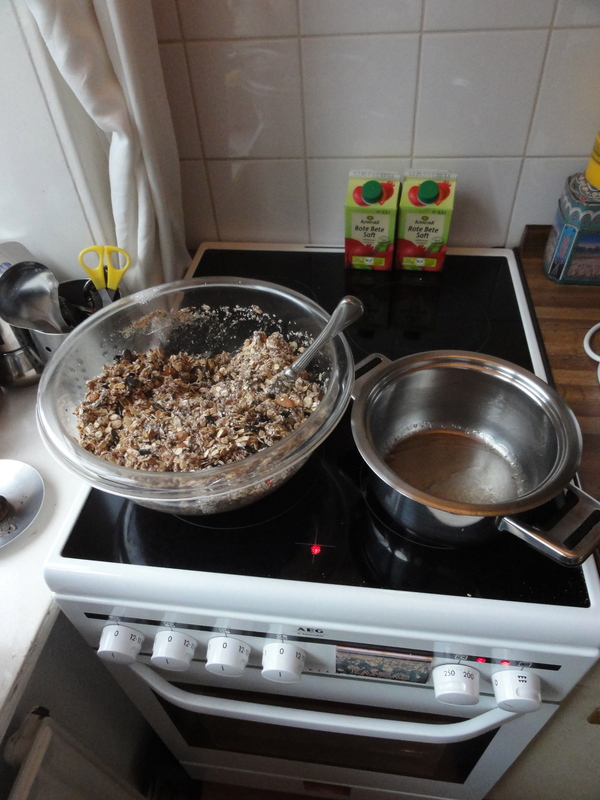 Enjoy making some granola for yourself. After all, It’s not just hippie food. Granola can be made in advance, in bulk, and stored in a plastic freezer bag or even jars in the refrigerator. You buy the ingredients in stores that sell in bulk. Below is Charlotte Ann’s basic granola recipe. My mom has been making it since I was a teenager and she wasn’t even a hippy. Lol! The recipe is easy and simple. Mom, many thanks for sharing your recipe. ½ cup of Canola Oil *I now use Coconut Oil since 2012. 1 to 2 teaspoons of Vanilla, if desired. You can also experiment to your own personal taste and add other ingredients such as flax seeds or pumpkin seeds or other likes. Heat together ½ cup of oil (canola or some other oil) and ½ cup of honey. Add 1 to 2 teaspoons of vanilla. Mix the wet and dry ingredients together. Bake on an oiled cookie sheet @ 350 Fahrenheit or 175 Celsius for 20 to 30 minutes -stirring once or twice. You need 7 cups of dry ingredients to 1 cup of wet. After baking, mix either raisins, dried cranberries, or other preferred dried fruit to taste. My personal preference is for raisins. I like to add my fruit with the grains after baking but you can also add fruit before baking for carmelization. This entry was posted in Value Added Products by Robert. Bookmark the permalink.